Let’s quickly establish something: Toyin Abraham’s movies aren’t meant for everyone, but her audience is always there to gulp them. So throw your intelligent critiques out the window when Abraham furnishes theatres with ratchet comedies that are loud, scatterbrained, and caustically funny. Also, there’s the perfected art of her movie branding and the profitable liaison with cinema gatekeepers. If you are like me, you probably will skip over Abraham’s movies as a matter of preference. But when you are left with no options, as I was yesterday browsing through the movie pamphlet at the cinema, then it becomes more of a gamble. 2017’s Alakada Reloaded, Abraham’s star-flooded Yoruba comedy, was messy and bombastic and sometimes farcical, but the movie gradually shaped a Nollywood canon that pushed Abraham towards the position of reliable purveyor. In her latest filmmaking effort The Ghost and the Tout, which began its press rollout last month, Abraham doesn’t deviate from her schtick as she stars as the main protagonist Isila. Isila is a sputtering character from the ghetto side of town, where houses are conjoined and shambolically built on vast beach sands. It’s such a tightly-knit area where everyone knows everyone, as when Ejike (Chioma Akpotha) announces her new iPhone 6 and the news is picked up by a child town crier and transmitted to every household. Disastrously, she would discover that her new, precious device is fake. The narrative strategy in Tout takes on a dual nature. Isila is mouthy, dominant, hermetically famous, and even influential enough to rescue Bobrisky’s effeminate character from gang bullying. The other narrative strand involves wealthy, soon-to-be-married Mike (Sambasa Nzeribe) and his pleasant, dewy-eyed fiancé Adunni (Bayray McNwizu). When Mike is shot while driving (not a spoiler because we already know that Mike is a ghost in the trailer) by mercenaries in broad daylight, I became interested in how the murder scene would be elevated beyond clichéd dramatisation. At this point, Mike now exists as ghost, inserts himself in the wailing crowd from a ringed-off side of the road and watches Adunni cry over his body. Back at the ghetto, Isila unwittingly acquires the power to see ghosts after beholding the face of a nocturnal masquerade. This is the movie creating its own mystique. And, in some undeniable ways, flows in a pastiche of Jerry Zucker’s 1990 romantic fantasy thriller Ghost. Tout erratically shapeshifts into other genres, from ratchet comedy to bad-and-bourgeois romance to hamfisted thriller. Because Isila is the only one who can see him, Mike severely implores her to help solve his murder – it’s an existential plea. Tout tries to be smart with how they communicate, and how they communicate with others, but the method is inconsistent and diabolically clunky. Often, poor editing and visual continuity rears up, rendering a scene hard to follow. Aside clichéd stories, this has been the bane of my Nollywood movie-watching life. 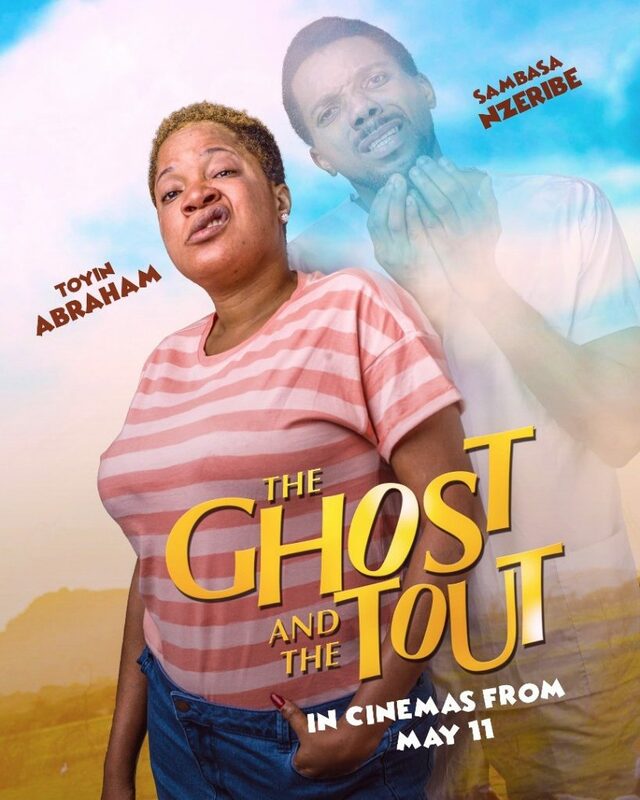 Directed by Charles Uwagbai, who has been in a healthy, professional relationship with Abraham, The Ghost and the Tout arrives as a consumable piece of gleefully schlocky comedy, besting AY Makun’s exquisitely-made touristy flicks and other proprietors in the genre.